Now that you know how to roast and carve your turkey, you can start thinking about what to do with all those delicious leftovers! Chef J shares a couple of his favorite recipes for leftover turkey so you don’t get bored by day three! It’s the same every year: we’re afraid that there won’t be enough food so we buy the biggest turkey we can find. Then we spend the next week trying to figure out how to get rid of leftover turkey! The turkey sandwich is a classic for a reason, but you might have a hard time selling it by Monday. I like to give mine a twist with a heaping shmear of strawberry cream cheese and sun-dried tomatoes. But there are a few other tricks that can help you utilize the rest of your Thanksgiving feast; one of my favorite, easy ways to use leftover turkey is the quesadilla. I know, it’s not a big stretch from a sandwich, but a little melted cheese goes a long way. And you might get a few odd looks, but try some leftover turkey on your waffles Sunday morning, swimming in maple syrup. 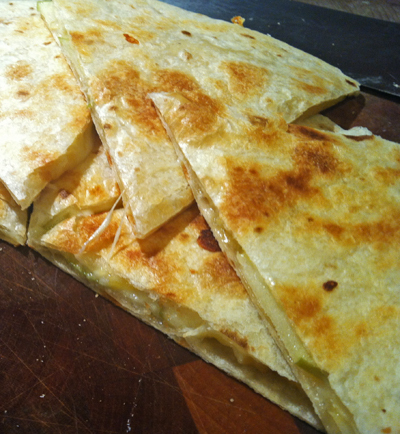 Place the tortilla on a hot griddle and evenly sprinkle on the cheese and rosemary. Layer the apples, then the turkey, over half of the tortilla. When the cheese has melted enough to stick to the tortilla fold it in half. Grill for about a minute and a half on each side until the tortilla is golden brown and the cheese is melty. Slice it up and enjoy! It’s also very good with a dab of sour cream and even a little bit of leftover cranberry sauce! Another simple staple of mine is teriyaki. It’s easy and healthy but has a comfort food feel that should please both the refined palettes of the culinary snobs as well as the picky eaters at your table. The sauce is quick to make, it will keep in the fridge for at least a week or can be frozen for the long term. Drizzle it over some reheated leftover turkey, with some rice, maybe a little sliced scallion, and break out the chopsticks! You can play with this recipe quite a bit- make it sweeter, spicier, garlicky-er, you can add a little wasabi or even a bit of chipotle. It also makes a nice glaze for meats and veggies on the grill! Mix all of the ingredients together except for the cornstarch slurry. Bring it to a boil, then reduce the heat and let it simmer for about 10 minutes. Mix in the slurry and simmer for another 4-5 minutes to thicken up a bit. Serve over leftover turkey with rice.